Based in Maine, USA. Offered around the world over the phone or via video chat. Read an unbiased review of what it's like to go through career coaching with me, according to a BI reporter! 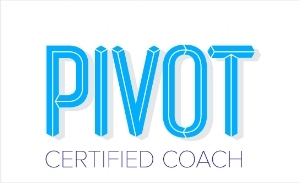 I was a proud member of the inaugural Pivot method training cohort, through which I became skilled at supporting clients through the plant, scan, pilot and launch stages by sought-after author and coach Jenny Blake. Pivot is a method I genuinely believe in because it's natural and intuitive while also being intensively thorough and pragmatic. We agree on what becomes a part of this between-session work. It arises from each call and might include responding to writing prompts about your vision for your life, taking a personality or values self-assessment or finding a certain number of people to informational interview. Have a question between sessions or simply want to share an "I did it!" update? Drop me a line any time! I'll respond in detail up to twice a week, all month long. I sift through the overwhelming abundance of information available online and in bookstores offer you just the ones that will help you make your vision a reality. Think of me as your personal curation machine. Send me drafts of your template cover letter, resume and LinkedIn profile and I'll put on my professor hat and mark them up to the extreme! Feedback, support and/or practice sessions as you prepare for informational interviews, elevator pitches, job interviews, the works! My coaching centers on on the career decision-making process and work-life strategizing. I help people through the weeds of career change choices, graduate school decision-making, and crafting their existing work to feed their lives - not vice versa! Then we come up with a tactical, concrete strategy to get you from where you are to where you want to be. I've worked with men and women of just about all ages and career stages, but most have been between 25 and 45 years of age. If you're contemplating a career change, want to make your existing work more fulfilling, or are trying to pick from many career options, the Pivot method to career change and my personal approach to coaching can benefit you. See my LinkedIn profile for additional testimonials! The Experience: "Maybe it's the kind of person I am, but when someone experienced tells me something is a good idea — and that they're going to check in with me in two weeks about whether I used it — I'm more inclined to do it. It helps, too, to have a cheerleader. Over the course of coaching, I learned that, for the most part, no one knew how much "extra" work I was putting in — except Fraser-Thill, who congratulated me at the beginning of every phone call for making inroads on the action work and wrote things like, "You are on fire!" in her follow-up emails. Obviously, she couldn't see me, but I grinned every time." The Experience: "Rebecca coached me through a career transition in 2013, providing weekly sessions over a three-month period. She was supportive, insightful and encouraging during a tough time in my career, and hugely helped me in clarifying my values and goals. She was always well prepared, providing excellent notes and sharing additional thoughts, and I very much felt that she was alongside me on my journey." The Results: "I’ve now found a work environment that I really enjoy and that suits my strengths and needs, yet I often look back at my notes as a reference point and for renewed inspiration. I would highly recommend working with Rebecca if you’re committed to pursuing meaningful work and ready for an active collaboration with an experienced guide who walks her talk." The Challenge: "Upon graduation from college, I left the States on a research fellowship that allowed me to focus on a project and not worry about what came next. A year later, my project was done and I returned to the States, beginning to wonder where I should go from there. Since returning from my travels, I've tried numerous methods of figuring out what's next. Grad school? Sticking with a job I don't like? More traveling? Despite my good intentions, I wasn't making progress. I felt more and more lost. One day I came across an article about a course Rebecca was teaching on designing one's future. I contacted her hoping to get a copy of the syllabus or some suggestions on reading materials that might help me. She responded right away with a number of resources and also generously offered to speak with me over the phone about what was going on. That first brief phone call, despite being an informal conversation, was enough for me to know that I wanted to work with Rebecca as my career coach." The Experience: "Though I've had only two formal sessions with Rebecca so far, things are already feeling better. When speaking with Rebecca, it feels like she 'gets' it. She is an amazing listener, she is engaged, and she always asks thought-provoking questions. I felt that I was at a standstill, and working with her has helped me regain some momentum as she has helped me set short-term goals and keeps me accountable. After both of our sessions, Rebecca sent me detailed notes on what we spoke about, including additional resources to check out. These have been incredibly helpful as I tend to overestimate the extent to which I will remember things a week later. Rebecca has been flexible, reliable, and kind and is an expert in what she does. To me, that was one of the most important factors in deciding to work with her. There are many well intentioned people who are good listeners, but Rebecca has experience and knowledge that I have not found elsewhere." The Results: "As someone who was feeling overwhelmed and skeptical about whether coaching would help, I can say without hesitation that working with Rebecca has made a bigger difference than all of my other efforts. Though I'm not yet at the point where I've made a final decision, I feel much closer than ever before and its only been a few weeks. Whether choosing your first career or wanting a career change, I cannot recommend Rebecca more highly. Rebecca's kindness and compassion will make you feel comfortable talking with her, and her expertise in purposeful work (and familiarity with relevant literature and research) will make the real difference in terms of making progress with finding direction. It is the combination of her personality and expertise that make Rebecca such an exceptional coach." The Experience: "I worked with Rebecca over a 3 month period. Her encouraging words and fresh perspective helped me more clearly hear my own voice as I navigated big career changes." The Results: "After years of feeling stuck and considering change, I made more moves in three months than I had in 2 years. After 8 years in an industry I didn't enjoy, I quit my job to start a freelance business! I also booked a long desired month long trip to Europe. The business ended up being a bridge to a full-time job in a completely different industry. It was a position I identified in our first few sessions together. We worked together to create a statement that captures my unique values. Over two years later, I still reference this as a guiding light when I making decisions or feeling unhappy in a situation. I learned how to listen to my inner voice. I have an easier time tuning out unsupportive people so I can figure out what I really want to do and what I think is possible. I started to actually take action! I've left analysis paralysis behind and I've learned how to continue to take massive steps towards the life I want." The Challenge: "I consulted with Rebecca when my job search was at a low point. I had applied to several positions, but no one had gotten back to me and I was worried. Rebecca's role in my job search was to help me identify and pursue opportunities that fit with my career and personal goals." The Experience: "During our meetings Rebecca listened intently and always probed further if I said anything that she did not understand. Through our discussions, we developed a new approach for my job search. The new strategy included reaching out to college alums and Rebecca's colleague at an organization that I was interested in, broadening my search to include full-time jobs, internships, and fellowships, and keeping a log of all my applications. She also suggested some books and podcasts to help me think about life after college and what it means to have a job that is meaningful. She constantly checked-in to ensure I was on track. Finding a job is stressful, but Rebecca's compassion and empathy made this experience more bearable. In addition, knowing that the person I was getting advice from had gone through a similar experience gave me confidence. The Results: "Before I graduated in May of 2016, I had landed a summer internship with a market research firm in Boston and a fellowship in California. I am happy with my summer internship -- the work is interesting and my colleagues are kind." The Challenge: "Combining my past experiences, passions, personality, and goals into a clear career trajectory." The Experience: "Rebecca worked with me through my college years constantly defining and refining what was most important to me in my future and how I can best fit those qualities into a future career. She was always an engaged listener who was able to see how aspects of myself can fit into specific professional roles. Rebecca was always patient and was able to create an environment where I felt both supported and pushed to realize what I truly wanted in my life." The Results: "I am now about to start social work school in the Fall. After exploring a number of different options, I feel as though social work is the right discipline for my personality and to fulfill my sense of meaning and purpose. Without Rebecca, I would have never considered the field of social work, and for that I am forever grateful." "Rebecca advised me through a major life transition as I searched for my career path in the months leading up to my graduation from college. She came to every meeting well prepared, but maintained an approach that allowed room for me to lead and mold the conversation. Her attitude was motivating and her guidance felt assured and remarkably perceptive. At the end of each session I felt like she had facilitated my growth towards novel conclusions about myself and my interaction with the world. Rebecca is the perfect person to work with during career and life transitions. She is intelligent, caring, and has the ability to profoundly impact a person with a well-timed insight. Though I am now settling into a career in mental health, I still feel that her mentoring continually benefits my life. If you are looking to find meaning and purpose in your career, I would highly recommend working with Rebecca." "I have known Rebecca for nearly ten years. She is a perfect career coach: smart, kind and incredibly supportive. Rebecca helped me through a difficult period in my life when I searched for a meaningful job amidst the financial crisis. Her advice and support – always spot-on – have been instrumental when I applied to graduate programs some time later. Rebecca taught me how to embrace challenges and reach for the top. The result: I found a great job and later got accepted to the graduate program of my choice at an Ivy League university. I am very happy with the choices Rebecca helped me make and I could not have done what I did without her guidance. Rebecca is at once a great listener and problem-solver. She’s a ray of sunshine – warm, positive, and full of energy. It is impossible not to feel happier, stronger, and more confident after talking to her." "Rebecca really listened to me while I was working through some tough career decisions. She understands that career and life need to mesh and the importance of finding a career that fits who you are as a person. She is compassionate, trustworthy, and understands the impact of this decision. Rebecca will guide you to ask yourself the tough questions and then provide you with the tools you need to put those answers, and yourself, to work in a rewarding career." If you'd like to work with me, please Fill out this form. I'll get back to you shortly with an update on my upcoming openings.